Published by Tomahawk Press, 2011. 568 pages. Out of all the actors in the horror genre, Boris Karloff has always been my favorite. I’m sure it has something to do with the fact that Frankenstein is one of my favorite films, where his performance there has never lost its impact on me. But even though he was typecast as a “boogyman”, he didn’t mind it, nor did it stop him from having such a diverse career, working in so many different genres, on film as well as the stage. He was also never ashamed of his work in the field, especially with the role that made him immortal, often calling the creature his “best friend”. 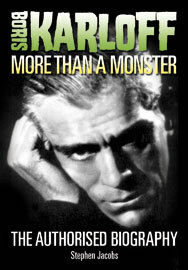 There have been quite a few books written on Karloff over the years. I even have 10 different titles in my own collection, such as Dear Boris by Cynthia Lindsay, Karloff by Peter Underwood, and The Films of Boris Karloff by Richard Bojarski and Kenneth Beals, which was a title that I was eventually told to stop checking out at my school library because I needed to give other people a chance to get it! One of the best biographies I had read on him was Boris Karloff: A Gentleman’s Life by Scott Allen Nollen, which came out in 1999. I learned so much more about this great man reading this book. But now, I have recently finished another biography that I have to say surpasses that incredible volume. And that would be Boris Karloff: More Than A Monster by Stephen Jacobs.